It takes an entire community to impact change. With a focus on improving community conditions in the areas of education, income and health during our first Day of Caring was held on June 21, 2013. Volunteers from Vanacore, DeBenedictus, DiGovanni Weddell LLP, Liberty Mutual Insurance, Safe Harbors of the Hudson and Central Hudson Gas & Electric helped to build a community garden at the Newburgh Armory Unity Center by laying garden beds, relocating soil and mulching and preparing the land for planting. 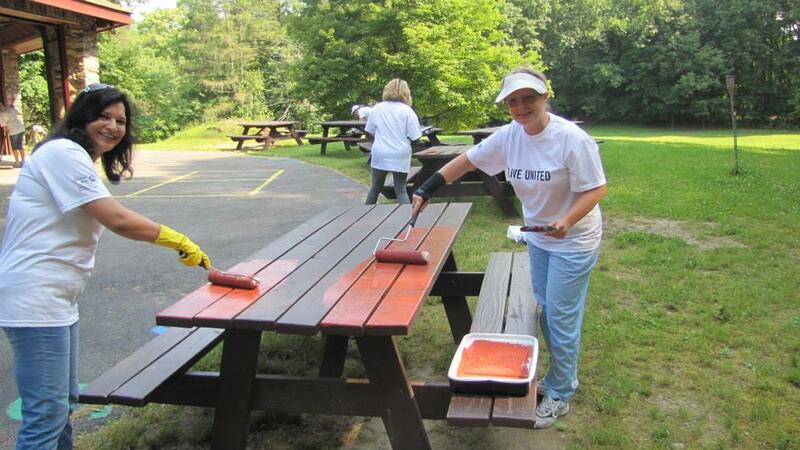 A second group of volunteers from YMCA of Dutchess & Eastern Orange, Provident Bank, Myles Financial Services and United Way rejuvenated YMCA of Dutchess & Eastern Orange Camp Robbins by painting and power washing areas of the property. Make a Difference Day brought together many community partners to revitalize the North side of Poughkeepsie in collaboration with Habitat for Humanity Dutchess. Nearly 300 volunteers from organizations such as Hudson Valley Young Professionals, Marist College, Astor Services for Children & Families, Youth One Stop, Arlington School District and Marshall & Sterling came together to roll up their sleeves and lend a hand to families in Poughkeepsie. Adams Fairacre Farms in Wappingers with help from Mercedes-Benz of Wappingers Falls hosted a project to collect non-perishable food items for Dutchess Outreach. Young Leaders United volunteered their time to collect supplies for fifty local families. Lending their muscle, Trinity-Pawling School student athletes rejuvenated the Pawling Historical Society as part of the largest day of community service.